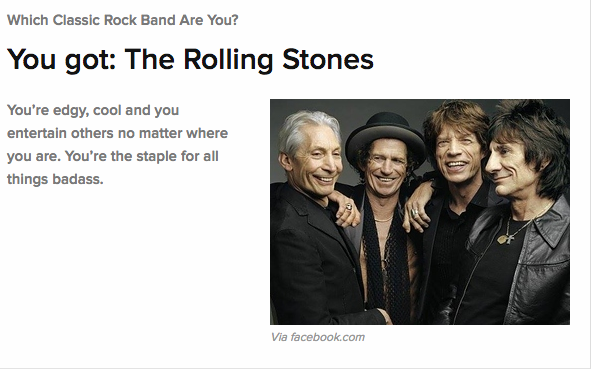 Time Waster: Which Classic Rock Band Are You? I’m learning so much about myself. But Mom, I don’t WANNA be a classic rock band. Awww, did you score Pink Floyd again? I got Led Zeppelin. Coulda been worse. I wonder what the worst would be? My first thought was Yes, but since the three answers I’ve seen so far are the Beatles, Stones and Zep, they may not go that deep. I got Led Zep and I’m quitting at that. Although I didn’t read any of those books and I don’t know any Kelly Clarkson songs.